Unroll pie crusts on work surface. 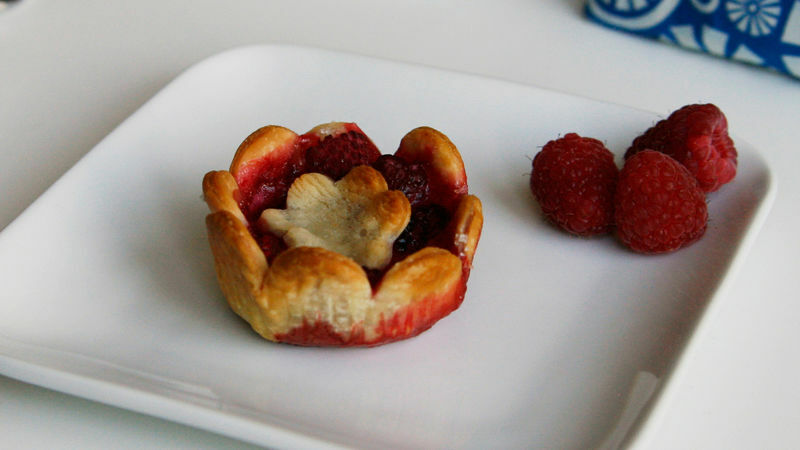 Using large flower-shaped cookie cutter (3 to 4 inches in diameter), cut 12 flower-shaped pieces pie crust. Using a mini flower-shaped cookie cutter (about 1 inch in diameter), cut 12 small flowers. Stir together frozen raspberries and sugar. Press 1 large flower into each muffin cup. Divide white baking chips evenly among crust-lined cups. Divide raspberry mixture evenly among cups. Place 1 small flower-shaped cutout on top of each. Bake 18 to 22 minutes or until golden. Cool. Serve with ice cream. These can be stored in an airtight container for up to two days. No need to defrost the berries before cooking–the oven will take care of everything.